"We loved being so close to the slopes. Super spacious condo, heated bathrooms floors, great sledding hill made for a great family vacation. The bathrooms were over the top fantastic. I stay at many five star resorts for work & those bathrooms topped them all. Loved it!". -The Anderson Family, VA. Norwegian Log, Dec 2008. There are several things you can count on when you vacation in Steamboat: rich western heritage, small town hospitality, and snow, lots of it. With an average of nearly 30 feet of snowfall every season, you can expect to relish in many satisfying powder days. But it’s not just any snow here in Steamboat, we have the driest and fluffiest snow in the world. It’s so different, we coined the phrase Champagne Powder®. In fact, meteorologists have measured Steamboat’s Champagne Powder® as having 70% less moisture content than average snow. If you have a hard time believing it, visit us in Steamboat and get a taste for yourself. Gladed areas of Sunshine and Storm Peaks are Steamboat’s particular claim to fame, with Champagne Powder® snow in the trees for the most avid powder hounds. Striving to provide the best in family programs, Steamboat continues to upgrade and expand its kids’ areas, while offering complete instruction and day care. Steamboat pioneered the first Kids Ski Free program back in 1982 and continues to offer it today. The program offers kids 12 and under free skiing when a parent purchases a five or more day lift ticket. The Steamboat Ski School is recognized as one of the finest in the world and offers a full line of programs to suit all ages and ability levels. The expert staff of more than 400 instructors has been trained in Professional Ski Instructors of America (PSIA) courses and continue to learn the latest, most sophisticated skiing and teaching techniques throughout the season. Beginners are introduced to skiing utilizing an excellent beginners only area and lift. Intermediate and advanced skiers have an incredible variety of programs, bumps, powder and snowboarding classes as well as Women’s Ski Seminars and the Billy Kidd Performance Center. Steamboat also has a complete Ski Touring Center for cross-country enthusiasts. Situated at the base of Mt. Werner below the Steamboat Ski Area are 30 kilometers of groomed trails for skating and tracking skiing, winding alongside beautiful Fish Creek and the surrounding countryside. These gentle rolling trails offer just the right mix of diverse and challenging terrain. Lift and lesson packages also are available at the Steamboat Ski Area Ski School Ticket Office. A free shuttle runs daily between the ski area and the Touring Center. The region is famous for its mineral hot springs, particularly the natural setting of the Strawberry Park Hot Springs located seven miles outside of town. The best way to relax after a long day of hiking, skiing or riding is to soak in the natural, mineral hot springs that spew from the Steamboat hillsides at temperatures of approximately 150 degrees Fahrenheit, and flow down into beautiful soaking pools. There are also hot springs located downtown at the Steamboat Health and Recreation, which provides three hot pools for relaxing and swimming laps, all of which are naturally heated. Steamboat is also home to many wonderful and relaxing day spas. Take some time for yourself and enjoy a massage, facial or a whole new look! Ask any local resident. They came for the winter sports but they stayed for the multitude of Summer activities and events offered here. The natural beauty of Steamboat Springs will take your breath away. With over 100 bars and restaurants, Steamboat Springs offers a variety of ways to satisfy your tastebuds. After experiencing the culinary arts, experience more of the cultural arts that Steamboat Springs has to offer. 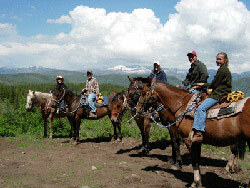 We know the beauty of this location in the Rocky Mountains of Northwest Colorado, in addition to world famous mountain biking, kayaking, hiking trails, fly-fishing, and world-class golf courses will make your vacation in Steamboat Springs, Colorado a memorable experience you will want to enjoy again and again ! 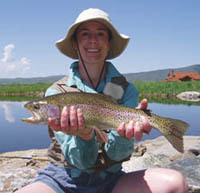 Steamboat Springs offers families numerous summertime activities where parents and children can play and experience the wonder and excitement of the mountains. Spend the day playing golf on one of our beautiful resort courses, mountain bike, fly fish, whitewater raft or hike on one of the endless trails. After a hard day of play, you can relax with some good old fashioned western fun – the rodeo! Steamboat – It’s one of Mother Nature’s most lush playgrounds– offering national forest lands, state parks, wilderness areas, rivers and lakes for fun filled outdoor activities. Arts and cultural events, shopping, dining and special happenings highlight your trip to Steamboat. The outdoor possibilities in and around Steamboat are limitless. 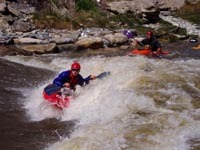 From fishing, biking, and horseback riding, to kayaking, rafting, and golf… pick your adventure! Your vacation’s biggest dilemma: the need to prioritize. Steamboat’s western authenticity can be seen throughout the town in the working cattle ranches that still surround the resort, the locals’ casual lifestyle and down home friendliness. Centuries before Steamboat Springs became the world-class resort it is today, the Ute Indians adopted the area as their summer home. Today it’s common theory that though Steamboat locals endure the winter, most stay for the summer. Nestled along the banks of the Yampa River, in the midst of a wide, open valley on the western slope of the Continental Divide, Steamboat Springs’ alpine climate creates summers known for perfectly mild temperatures & cool evenings. Rollerblade or stroll from one end of town to the other on the beautiful Yampa River Core Trail, or zoom down the new alpine slide with views of the valley, or mountain bike the many trails of the area including the ski mountain, ride the white water of the Colorado, float the Yampa in a inner-tube, learn to fly fish, go horse back riding, play golf at one of our 4 golf courses, see the sights of Steamboat from high in the sky in a hot air balloon, digest with the aid of the Strings in the Mountains music festival, or hitch up your jeans & mosey down to the ProRodeo on Friday & Saturday nights. We told you, your biggest dilemma; the need to prioritize! The region is famous for its mineral hot springs, particularly the natural setting of the Strawberry Park Hot Springs located seven miles outside of town. There are also hot springs located downtown at the Steamboat Health and Recreation, which provides three hot pools for relaxing and swimming laps, all of which are naturally heated. Come breathe the pure mountain air & enjoy views that haven’t changed much in 100 years.